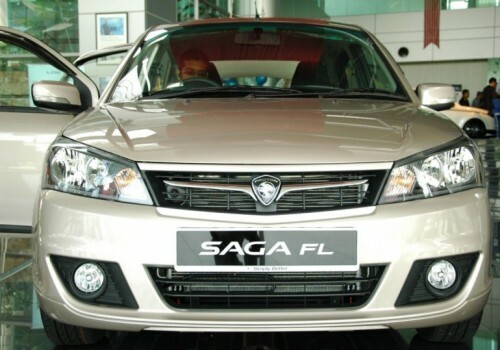 You have seen the facelifted Proton Saga from our Thai Auto Expo 2010 coverage earlier this month, and now it’s the Malaysian market’s turn to get the car. Unveiled by Proton MD Datuk Syed Zainal moments ago, it is officially called the Saga FL. From the boss’ speech, and the new features, we know that Proton is trying to get the younger crowd to consider the Saga as their first car, urban middle class folks that would otherwise buy a Myvi. The Blue Rock colour you see here is one of the two new colors (the other is Cafe Latte, a light brown hue), and is the same colour as the Thai show car. There are now two trim lines – Standard and Executive – down from the previous three. Manual (5-speed) and automatic (4-speed) choices are available for both trims, which mean that there are four possible configurations. 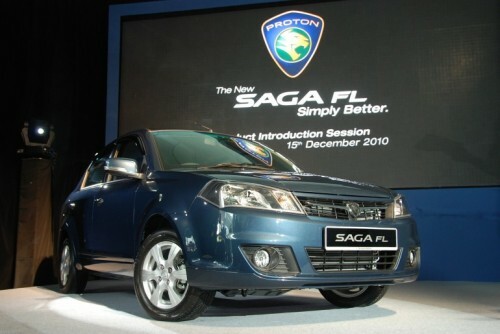 Powered by the same 1,332 cc Campro engine with 94 hp and 120 Nm, the Saga FL gets Proton’s new face, which will be sign of things to come. As detailed before, the new exterior consists of new lamps front and rear, new grille, new bumpers on both ends and new design rims. Standard variants ride on 175/70 R13 wheels while Executive FLs use 185/60 R14 rubber. Most of the new features that the FL gets over the old car is for the Executive. They are dual airbags, steering audio buttons and USB/AUX ports for the Clarion MP3 stereo. 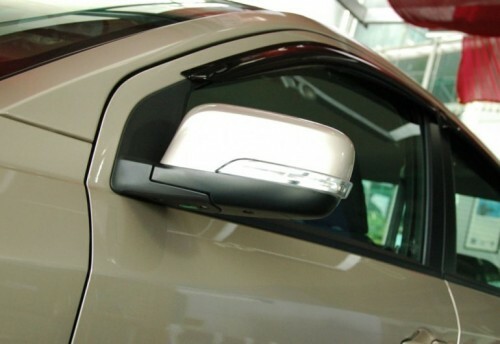 New goodies available on both trims are side mirrors with LED signal lamps, rear power windows, rear LED tail lamps. The rest of the Executive-only equipment includes driver’s seat height adjuster, powered wing mirrors, fog lamps and slim rear spoiler. 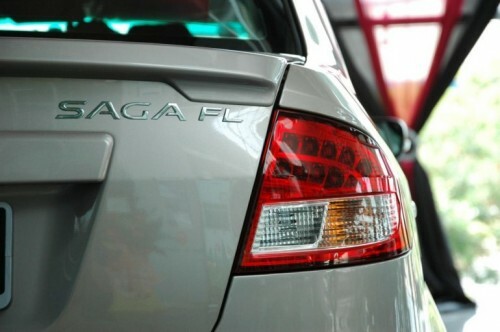 The new Proton Saga facelift is now available in four different variants – the Standard M/T and A/T as well as the higher spec Executive M/T and A/T, which is one grade level less than the pre-facelift Saga, which was available in N-Line, B-Line and M-Line. Effectively, this means very basic N-Line with the cheapest price tag and the black bumper is not represented in the new line-up. All models have the front and rear power windows, MP3 function for the audio player, and the side mirrors with LED turn indicators. 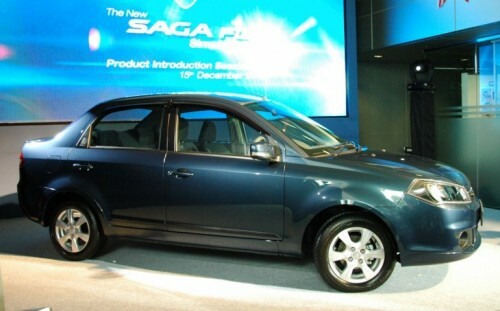 What the Executive model adds over the Standard model are the USB and AUX input, the dual front SRS airbags (Standard model doesn’t have any airbags), steering wheel audio switches, driver seat height adjustment, electric door mirrors, fog lamps, rear spoiler, a multipurpose container and side protector moulding. Wheels are alloys wrapped with 180/60R14 on the Executive, and steel wheels wrapped with 175/70R13 on the Standard. The engine and gearbox remains the same as the pre-facelift Proton Saga for now, however Proton has indicated that they will be rolling out an update to the Campro engine family sometime next year, and this update could include the new Proton Saga. The update will include improvements to the normally aspirated Campro engines as well as add a new turbocharged variant for models like the Proton Exora. The Saga is available in Solid White, Tranquility Black, Genetic Silver, and two new flours – Cafe Latte and Blue Rock. Our live galleries after the jump are mostly of the two new colours so you’ll know what they look like. Of course, the most important part are the new prices. 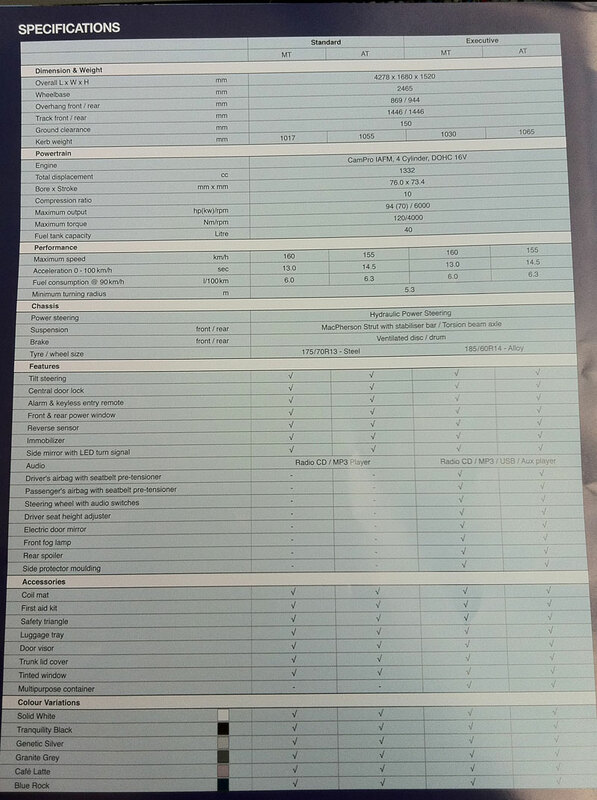 Prices have gone up by about RM1,000 to RM1,300 across the board, which is not too bad a jump considering there’s an extra passenger airbag in the airbag-equipped models. 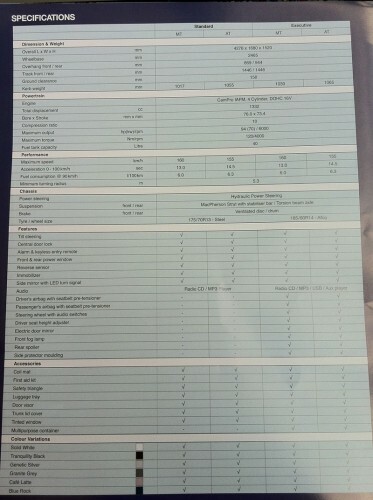 In the price comparison, we’ll compare the Standard with the B-Line and the Executive with the M-Line. Story by Anthony Lim, Danny Tan, Harvinder Sidhu and Paul Tan. Previous Post: Nissan and Mitsubishi expand scope of cooperation – next gen Triton and Navara are set to be twins!